Turn your laptop PC into a powerful street navigator with the GPS 18 — a GPS sensor bundled with nRoute® and MapSource® City Navigator® software that automatically guides you with turn-by-turn directions and voice prompts to your destination. GPS 18's compact size is perfect for salespeople or other business travelers who take their laptop on the road. 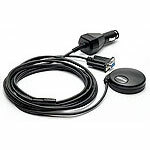 The small, highly accurate GPS 18 is a 12 parallel channel, WAAS-enabled sensor, available with either a PC or USB connection. It comes with an integrated magnetic base and is less than three inches in diameter.